I see games all the time from rental stores covered in stickers. These games exchange hands many times before ending up in my possession, so it always confuses me when I get a game that has a bunch of stickers all over it. No one thought to restore it? I don't understand why you wouldn't clean up a game if you buy it. I talked about this in my previous Nerd World Problems article, but I just encountered the problems I discussed in it again. 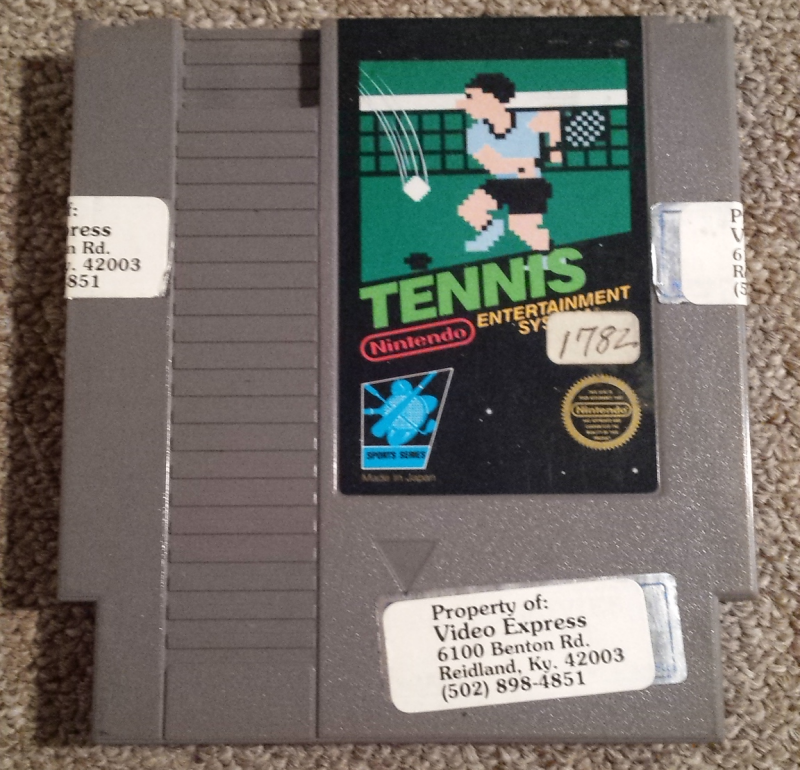 I was given this copy of Tennis for the NES around Christmas. I wanted it because it is a variant I didn't own (three screw, no cart ID). I put off cleaning it for a while because I knew the undertaking it would be. In addition to the stickers you see here on the front, the stickers on the side wrapped around the cart and onto the back half. There was also a small sticker on the back near the top that had the same 1782 rental code written on it. The white stickers are actually on top of stickers from a completely different rental store in a different state, and neither of them are from the state it was originally bought in. Basically, this game has been around. In total, this game had eight stickers on it. Holy cow. It looks fine (other than the stickers all over it) for something that has traded hands so many times. 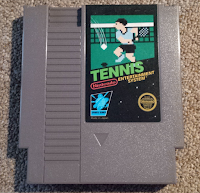 Actually, I'm sure not many people rented Tennis for the NES when it was new, so it probably didn't have many opportunities to get damaged. Anyway, I'm surprised my friend owned this for as long as he did and never felt the need to clean it up. I get that even I put off doing it because I knew it would take a bit to restore it, but I only had it for about two weeks before I finally gave in and cleaned it. The end result is very nice, and it looks a lot better than it did slathered in rental stickers. If it was something actually rare or valuable, I'm sure it would have been cleaned up well before now. Maybe people just decide it's not worth their time to clean up something that isn't that interesting. I don't have a single game in my collection that has a rental sticker on it. Things actually written on them, yeah, some of my games have those. But something that could easily be remedied with a bit of Goo Gone and some time will not be found. It bothers me too much. 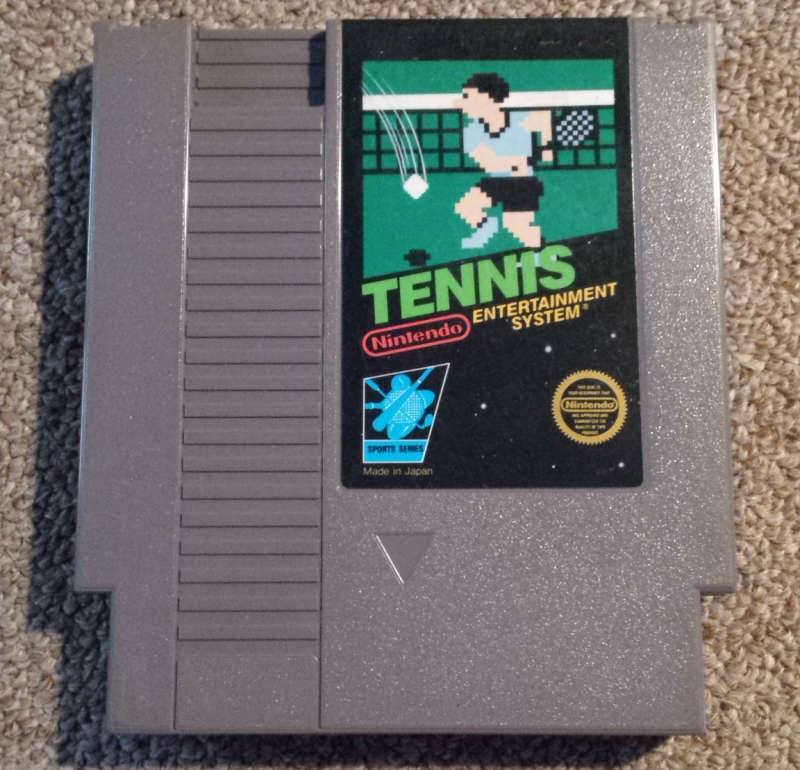 Even this copy of Tennis wasn't kept with my other games until I cleaned it up. It's another nerd world problem, that's for sure.